The Ducks began a series of interviews and press conferences this morning at the L.A. Downtown Hotel in anticipation for the Rose Bowl semi-final game against Florida State. In a video interview posted by Comcast SportNet, defensive coordinator Don Pellum, senior outside linebacker Tony Washington, and senior safety Erick Dargan all spoke to Oregon head coach Mark Helfrich’s “Men of Oregon” philosophy and his coaching style that has kept this football program in the national title hunt. 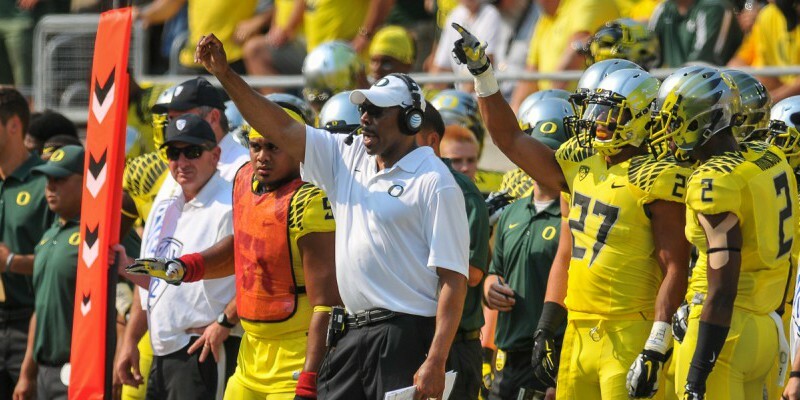 While Pellum has amassed 21 years with Oregon as a coaching assistant, Oregon’s first year defensive coordinator defers nearly all the credit to Helfrich, who has entrusted the defense into Pellum’s capable hands. In his second season as Oregon’s skipper, Helfrich has seen great results from his defense, developing leadership qualities in players such as Washington and Dargan. Both young men attest to Helfrich’s belief in them as players and men, striving to put forth the best possible version of themselves. Washington has compiled an impressive portfolio while at Oregon, with a career total 147 tackles and 13.5 sacks, according to Sports-Reference.com. Dargan has been an absolute terror in the Oregon secondary, grabbing six interceptions (leads the Pac-12) and posting a career high of 82 tackles (10th in Pac-12) this season. Dargan was with the 2011 Ducks when they lost to Auburn in the BCS National Championship game and has used his past experiences to grow as a leader and teammate. “He’s really pushing us towards greatness. And that’s something we’ve been chasing for a long time,” Dargan said. The Oregon defense has been nothing short of great this year, maintaining their growing reputation as an intimidating and irreconcilable force on the field. It is becoming clear that Helfrich has this entire Oregon team believing that they can achieve what teams of Oregon football past have not: win a national championship. And on behalf of FishDuck.com and Oregon fans everywhere: we believe in these Ducks, too.